Remember the Mystery Slab? I've had quite a few people ask me if we've learned what its purpose, and the answer is "no." 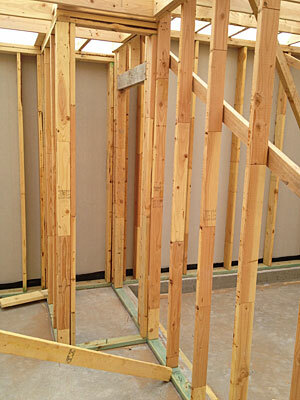 It's still a mystery, perhaps even more so now that framing of the house has begun. 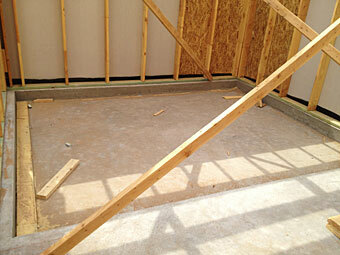 Here are a couple of photos showing how the sunken portion of the house foundation is roughed in. The photo on the right shows the only entry* into the "room," via a narrow door from what we think is the laundry room. Perhaps when the house is wired, we'll be able to better discern the nature of this construction, but for now it continues to remain a mystery. *It's worth noting that just because there's no other doorway at this point doesn't mean there won't eventually be one. Framers have been known to make mistakes, as we learned when our guest powder room had no doorway at all for quite some time until we pointed it out to the builder. Utility room sounds plausible, especially if a water heater will be placed within that space to insure that if there are any leaks from the washers or water heater, the water will be contained. It's not that, John; there's no drain. Since I posted this, I found out from the builder what the room is going to be. Stay tuned! This page contains a single entry by Eric published on May 2, 2012 6:30 AM. Midland's Field of Dreams? was the previous entry in this blog. Random Thursday - The Weekend Edition is the next entry in this blog.